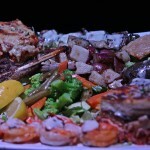 “You love it, baby” is the fun slogan behind Stratos, the reigning champ of authentic Greek cuisine in DFW. And love it, you will. From the food to the atmosphere, I was impressed with every moment. Located just off 35, this gorgeous restaurant sticks out like a beautiful blue sore thumb, against the urban landscape of mom and pop shops. Upon entering, you are transported straight to the Mediterranean. Nick, the owner, is as warm and friendly as the feel of his establishment. 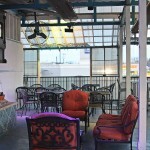 The huge restaurant with dance floor, stage and balcony seating is a unique mix that could be a blast for families, as well as a really fun date night. But before I get too deep into the party, let’s talk about the main event: The Food. Stratos started us out with their famous flaming “Opa”; which is a savory appetizer composed of Greek cheeses fried in a batter and oil mixture. The taste is reminiscent of a herb season mozzarella square; and the flaming presentation sets the tone for a fun evening. While chowing down on our appetizer, Flaming Eddie as Nick so affectionate calls him, made us his rainbow tower of martinis and showed off his drink artistry skills. Watching the mixologist work was already intoxicating; but the Blue and green martinis set us up for a truly liberating night. 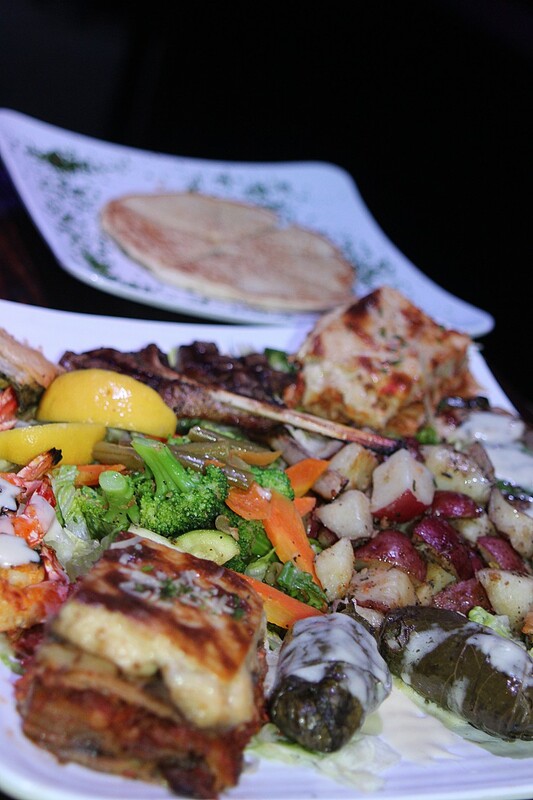 If you don’t have time for the dinner experience, check out their lunch menu with Greek favorites, such as Gyros and soups and salads. Even if you are intimidated by new things, Stratos has options for you such as their “For the Neighborhood” Menu that serves up Tex Mex favorites, like quesadillas and Latin shrimp cocktail. You can even order off the Casual Menu with Buffalo wings and chicken strips. With the excellent hospitality and care they put into every dish, I’m sure you will be impressed. If you want to truly experience Stratos, just ask any one their friendly staff for a recommendation. You may not be able to pronounce it; but great taste is universal. 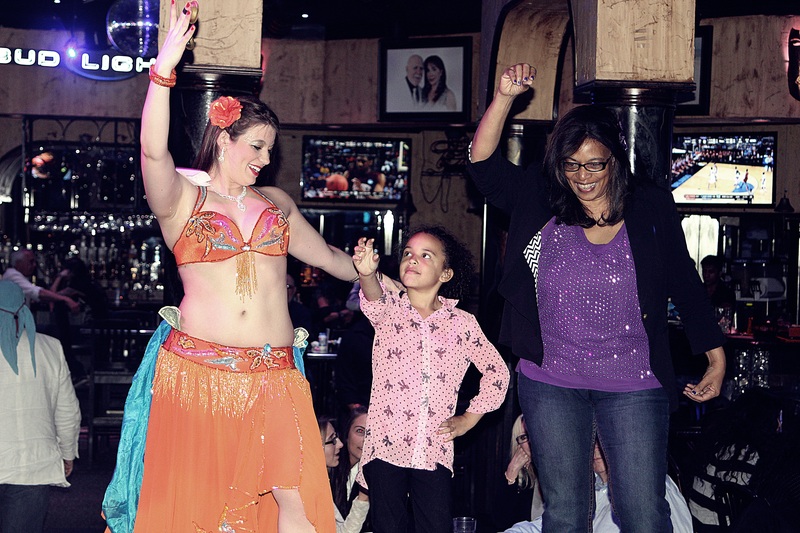 After eating ourselves into a coma, DEJ Associate Editor and staff Photographer Alicia Burden and I decided to throw caution to the wind; and dance with the belly dancer. This talented lady teaches course in Euless; and was a hit with the crowd. She danced with kids and adults; and even got a certain staff writer to balance a sword on her head. Over all, I would give the Stratos Experience 5 stars for excellent prompt service, friendly knowledgeable staff, great food, fair prices and excellent portion sizes. One question remains… When are we going back? 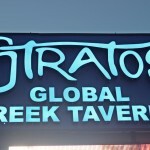 I’m thinking Mondays or Tuesdays sound great when Stratos has it’s weekly Customer Appreciation nights with half off dinners with the purchase of 1 beverage per entrée and 2.50 Domestic, 3 dollar wells and 3 dollar House Ritas. 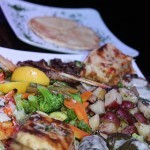 On Wednesdays and Sundays, you can experience all wine half priced and grab select Greek appetizers at half price. Once that liquid courage settles in, feel free to join the Bachata Passion after 9:30 with free dance instruction by Jay Styles. Thursday-Saturdays, it’ s Belly dancing and International Music. As all the signs throughout this gorgeous venue state, “Dance at your own Risk” . Everything about Stratos was out of the ordinary. And I loved it, baby!